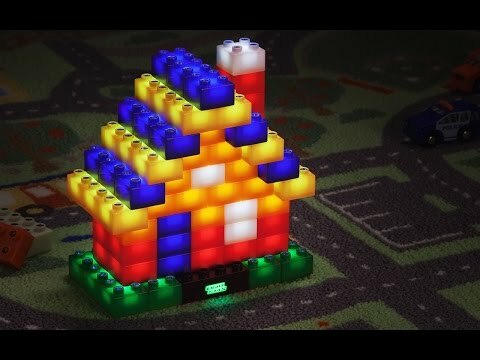 Light Stax is a light-up building block system powered by LEDs. Build up from the base, and each time you add a new block, it lights up. 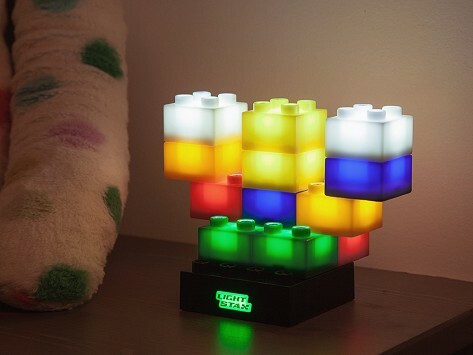 Brings light and striking color to kids’ creativity (and can even be a nifty night-light afterwards). And for grown-ups, Light Stax creations stand out on an office desk, too. Dimensions: Base is 2.5" x 2.5" x 1"; Each brick is 1.25" x 1.25" x 1"
Weight: 12 Blocks: 0.66 lb. ; 36 Blocks: 1.57 lbs. ; 102 Blocks: 3.29 lbs. My grandson really likes it. Works well with his other LEGO ‘S. Works well with his other LEGOs. My grandchildren love to play with these blocks. They combine them with their wooden blocks to make buildings. Got this as a gift for an 11 year old but now I want one and I’m in my 30’s! It worked! Nice additional dimension for legos/duplos. Light Stax are the new building blocks on the block—they glow via internal LEDs. Build a structure on the electric-powered base, and each block you add lights up. The result will be a multicolored statue of light that can blink, fade, or stay steadily illuminated. Inventor Johnny Lin got the idea for Light Stax while at a toy fair in China. He saw plenty of building block systems and LED-based toys but no combination of the two. A light went on (so to speak), and five years of development later, Light Stax was born. Johnny is now an award-winning toy designer. For kids, Light Stax is a bold way to play creatively. They can build a self-dimming nightlight. Or mix and match with Duplo blocks. As long as the Light Stax bricks remain in sequence, they’ll light up. And if you’d rather play with Light Stax yourself, they make a standout addition to an office desk. When it comes to these building blocks, there’s no age limit.